Submitted by Jeff Buster on Sat, 06/13/2009 - 00:16. We know from the Dealer (Henry Gomez) that the demolition of the Howard Johnson’s at East 55th and the interstate I 90 Shoreway was stopped by a Court Injunction. Where the Court enjoined the demolition - I take that to mean that the demolition went forward before any demolition orders and their appeal periods had lapsed. So, if the owner prevails in the Court action, the owner will be receiving some significant cash from Cleveland for the nibbles that the Cookie Monster took out of the South West corner of the hotel. Who encouraged the City of Cleveland to award this demo bid to Precision Environmental, a DeGironimo Company? I have visited this site many times, but this afternoon there was a Tenable Guard at the gate. Funny, the place has been vacant and accessible for decades: now, half demo'ed, it's got a paid security detail. She wouldn't answer any questions...and called her office as if James Bond had arrived. Wonder who's paying for Tenable? Submitted by Norm Roulet on Sat, 06/13/2009 - 01:03. Jeff - ythe time has come - you know we want this building for REAL COOP Brightest Greenest Place!!! I always loved this building and the view - I wanted to use it for an open source hostel, incubator, and REAL COOP HQ - and now I love it even more - the deconstruction element is absolutely sculptural, the negative space is amazing - it is a work of art and as Cleveland+ as anything ever. Jeff, see how we can get this building... contact the Cleveland law director - we can discuss tomorrow. We'll need to get engineered a way to seal off the demolished areas and make sure the building is safe. Then we do the minimum possible renovation and invite the open source world from around the world to come hang out, incubate, innovate, work, learn, start businesses, settle in, and be real. Submitted by Jeff Buster on Sat, 06/13/2009 - 10:47. It looks like the Hojo wrecking ball has hammered foundations down. The little darker vertical shadow line (between the two right hand vertical bays) suggests that these two bays had had foundation pile failure caused by the wrecking ball pounding down on the top floors of the building - they have settled. As you suggest, this is a great example of Cleveland's "negative space"
Submitted by Norm Roulet on Sat, 06/13/2009 - 15:15. Like after the bombing of Europe by the Nazis, this a building damaged by insanity... but look at Europe now, after rebuilding. 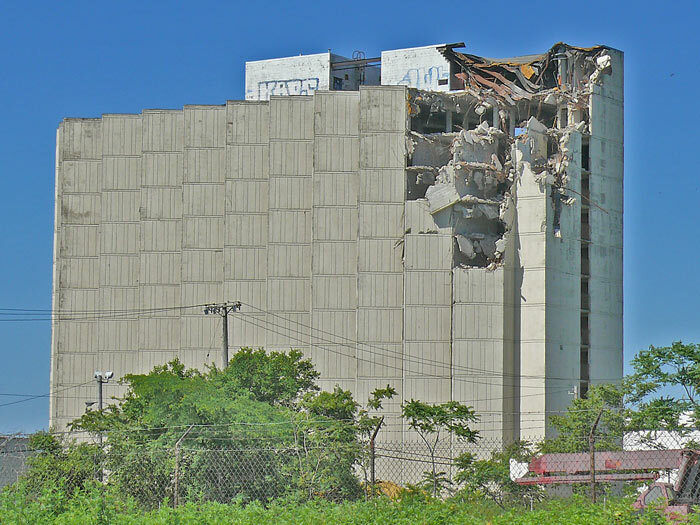 I am certain it would still be cheaper to reuse what is left of this building than demolish and replace... this looks like another white trash con to get land for some crook. Submitted by lmcshane on Sat, 06/13/2009 - 11:45. Jeff--can you swing by and get some photos of the Juvenile Justice Center that figures prominently in today's Corruption Probe story in the PD? Submitted by Kevin Cronin on Sun, 06/14/2009 - 00:42. Let me add some thoughts on the Howard Johnson's building near the shoreway. It's been underutilized for something like 30 years, but went to the current owners only a few years ago, asserting a desire to reuse it and build condos. They produced some architect and engineers plan that says they could do so, even with the partial demolition. They were ordered to post security guards (they were found not have posted them on consistent basis previously), repair the fence to prevent intrusion, post a sign indicating what was being done and post a bond to guarantee the payment to the city. The next time in court, they gave the city a check for $100,000 and said they had $20 million in financing from Louisiana, or some other southern state, available to them (although I don't think they actually produced the documentation). Last week, the court acknowledged the security guards were posted, though the fence was still not fixed and no sign was in place. Last week, the court gave them some more time to produce the plan for the city, including the sign and fencing. In my view, the building should come down as it seems worthless as condos (it's a motel, with all the old construction plans that motels entail, manufactured with thin walls). There's a difference between old and worth saving and just old. I don't have any reason to disbelieve, as the city asserts, that the new owners are just camping and trying to get money. Their own lawyer almost resigned after the first hearing, as he wasn't speaking with the owner at the time. Here's another thing to think about -- the judge mentioned that he was willing to consider the owner's desire to create jobs...But he's not the only one trying to create jobs! businesses in Hough and St. Clair/Superior have been trying to create and retain jobs, but the neighborhood's biggest front door, off the shoreway, tells the world that the neighborhood's not open for business, sitting on underutilized, partially demolished building, in one of its most prominent locations. For thirty years it's been under-utilized. Now someone comes in and says 'trust the, this is different.' Why? If it's really different, the new guys need to come up with real plans and real money and do it fast, with no new reasons for delay. Submitted by Norm Roulet on Sun, 06/14/2009 - 02:04. I love this building and we can make it the open source gateway to the brightest greenest place on earth - sounds like a good reuse to me. the damaged area should be kept intact if possible - it opens up the building to downtown views, making it better than before! Submitted by Eternity on Sun, 06/14/2009 - 02:04. What is wealth? How is it measured and when does one know when it's missing? Vision...that's an important component. But vision alone is not enough. Other aims must be considered, like economics, aesthetics, sustainability and waste. Too, one must also revisit the conceptualization of wealth. These are just a few of the questions one might ask when confronted with the complexities of urban revitalization. I touched on this in an extended comment, which I made a few weeks back in response to Jeff's prior post on the Shoreway's Howard Johnson. That comment entitled "A Historical Structure That Should Be Preserved" can be found here. Of course, however, I do not live in Cleveland. I live in Atlanta. But more importantly, I'm an American, who cares about America. So to that end, for the last 18 months, I have been at the epicenter of a fierce preservation effort here in Atlanta, championing a building that should be a national treasure to all of America. The site that I'm fighting for was created by Marcel Breuer -- being the last public commission of his 50 year career. 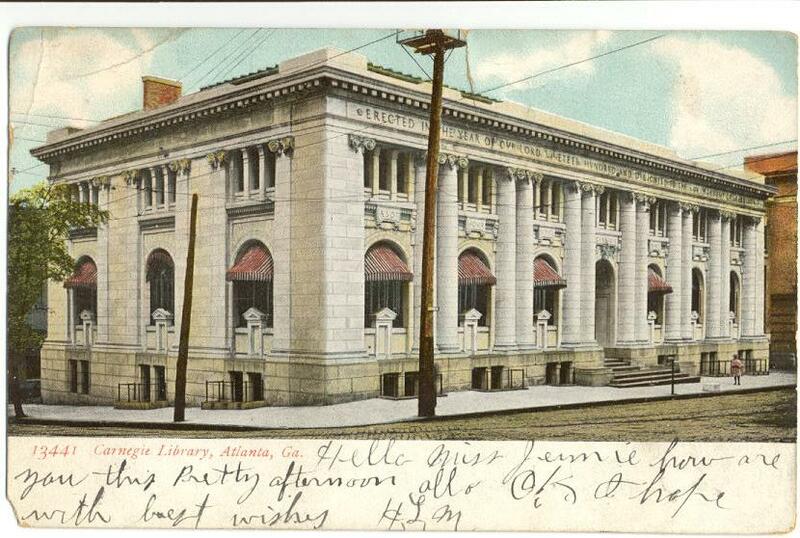 Though ironically, Breuer's Atlanta building (it must be said) was built on the grave of beautiful beaux arts public library -- named after its benefactor, Carnegie -- that was hastily -- foolishly -- demolished. This site (pictured above) should obviously have been preserved. I realize a Breuer is not the same as a Howard Johnson. Still, why does it seem the pro-demolition argument is always the same...LETS PAVE THE WAY FOR PROGRESS!!! But upon reflection, drawing from the theme that the first Breuer Atlanta preservation blog was created on, one will realize, more often than not, progress is preservation. There are many forms of wealth, though often it seems, we only value the dollar; our fleeting fiat currency. Still, in this current climate of economic uncertainty – fear – hysteria – terror-- one of the valuable lessons that I’ve been learning and relearning is to be happy and content with what I’ve already got. Some call that having gratitude. I call it pragmatic wealth retention. And for nearly a year now it has been my aim to assist in raising awareness about a collective civic investment that really affects us all; the preservation of the Downtown Central Library, designed by Marcel Breuer. There are countless reasons why we should all care – pay attention to – public education, policing and security, equal housing opportunities and health care accessibility. These aforementioned things tie us together. They can be seen as great equalizers, unifying us all. Along with civil liberties, they represent the centerpieces of democracy, giving us a sense of wholeness and equanimity, giving us a collective sense of pride. Few places is this better expressed than in our public library system; perhaps the most noble institution of them all. Yet in spite of this, there is an ongoing campaign led by Commissioner Rob Pits, which would lead Greater Atlanta down the wrong path. For as part of his current public discourse, for the last year, Rob Pitts has been rallying his troops, leading the call to demolish the Downtown Central Library, to sell the land to the highest [hotel chain?] bidder, and build a new central library a few blocks away. He is nothing short of obsessed, and because of that the full burden of proof lies on he and his supporters to make a sane, persuasive case with full disclosure and accountability. However, there are many who present a different case, espousing progress in preservation, and that brings us back to the issue of wealth. We all know that wisdom is wealth, and there are some, especially those of the civil rights age, who realized that a commitment to service renders wealth as well. Now in a time of gross obesity, rampant diabetes and other preventable (fatal) dis-eases, some are starting to realize that health is wealth too. The interconnectedness of life is undeniable; our environmental concerns have certainly proven that. But it is my observation that beyond those issues that are on the surface and quite obvious, there are more subtle concerns, which merit our attention as well. Preserving the Downtown Central Library is one of them. Submitted by Norm Roulet on Sun, 06/14/2009 - 02:09. So how is your Breuer battle going? We are ready to put our Breuer into reuse! Submitted by Eternity on Sun, 06/14/2009 - 02:45. I'm happy to report that the Atlanta Breuer still stands. The politician(s) who initially wanted to demolish it has (for now) toned down his rhetoric and the library director seems to be warming up to the idea of retaining the site's integrity. But as I'm sure you know, preservation and transformation, are going processes. Food that taste good can also be healthy, and cities that are economically in the black can also remain historically intact. The community of RealNeo is a wonderful achievement, and I see only good things coming from this type of civic engagement. What's the status of HOJO's property now? Submitted by ANGELnWard14 on Thu, 01/27/2011 - 00:26. Any updates on this demo project?